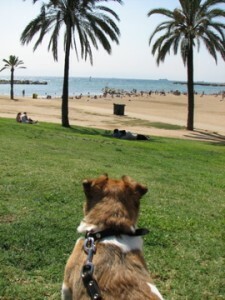 One our favorite places we visited while living in Europe was the amazing Barcelona, Spain – and it was very dog-friendly! 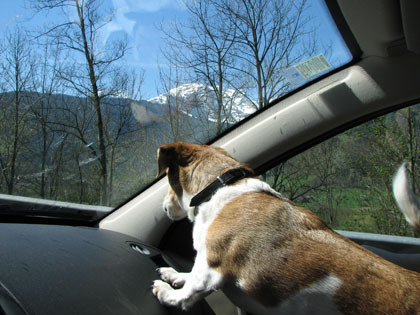 Of course, our small dog Bodie came with us. We flew KLM from Amsterdam – the only time we flew within Europe since it was a long drive! Upon arrival in Barcelona, I went searching for the place to meet Bodie (he unfortunately has to travel in cargo as he’s a few pounds/inches too big to fit under the seat). I went back over to my husband who was waiting by the baggage claim belt to tell him I had no luck yet, and out pops Bodie riding on the conveyer belt! He was the first piece of “luggage” on the belt, and luckily we were there to take him off so he didn’t get dizzy from going around and around! Everyone was laughing and peeking in to his kennel – it was a surprise to us all! He seemed happy that the flight was short (compared to the overseas flights which he was used to by then!). 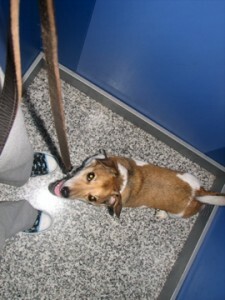 I have to applaud the KLM for being really pet friendly in both airports (Amsterdam and Barcelona). They were very friendly and caring about Bodie’s experience and took care of us all. They allowed us to take Bodie out for a walk before the flight (in both locations) and they also allowed us to stay with him until it was time for us to board the flight(s). All the KLM employees seemed genuine in their love of animals and were eager to help us. Bodie got a lot of positive attention during this stressful time! Bodie had a great time in Barcelona. 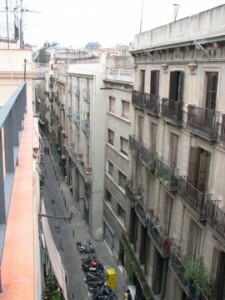 We stayed at an apartment in a quiet street in the Gothic area and had the rooftop patio all to ourselves. Bodie couldn’t see over the side, but enjoyed having extra room to run around and sniff! We all enjoyed exploring Barcelona by foot. It is a large city with lots of interesting areas. We ended up walking from our apartment, through the Parc de la Ciutedalla, to the Mediterranean Sea. It was a long walk, in hot weather, but we had lots of fun. 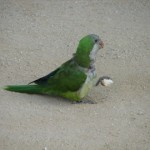 For Bodie, it was a trip of firsts – First time seeing a parrot in the park – very tame since they are fed all the time by Barcelonians. It was Bodie’s first time seeing the beach (as far as we know – at least the “beach” in Holland isn’t the same as the beach in Barcelona!). And it was also his first time riding in an elevator! Now he understands the concept. 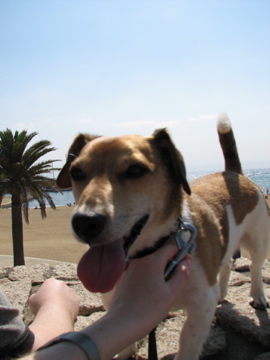 I definitely recommend Barcelona as a great destination to visit, and you can be rest assured that your pet will also have a fantastic time! If you are interested in visiting Barcelona, with or without your small dog, please don’t hesitate to email me at Leila@worldclasstvl.com! 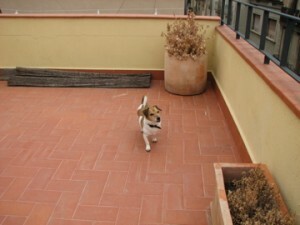 Previous post: What Do I Know About Traveling With Small Dogs? Next post: A Small Dog in Hawaii?